It's the time again when the poxy World Cup dominates every form of media available and people like me (who can not stand foodball) find it increasingly hard to avoid seeing any reference to the bore-fest that is the World Cup. Whether it's turning on the TV or radio, going on to the internet, walking past a poster on the streets, we will all be reminded every single day that it's that time when a bunch of grown men pretend to be children in a playground, kicking a silly ball around. So, for the first time ever I have a produced a video which I want you to share. Get your friends to share it. Get your family to share it. Get your work colleagues to share it. Hey, if your pet has a Facebook page, get them to share it too! Yes.... 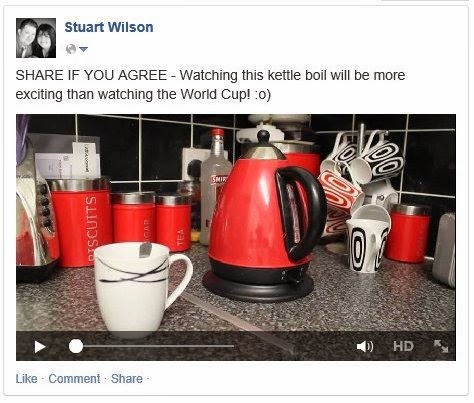 Watching a kettle boil is more interesting to watch that the World Cup. I imagine this whole 'sharing video' malarkey will end up failing miserably with only a few shares, but hey.... Why not!